In the northeast corner of La Corne Township, approximately 60 km north of Val d'Or is located The Quebec Lithium Project, operated under Quebec Lithium Inc. and owned 100% by Canada Lithium Corp. The site can be accessed through a paved road from Val d'Or, a mining friendly community that has over 100 years of mining history and a population of some 32,000 people. The city hosts an airport and significant support infrastructure. Quebec is one of the top-rated mining jurisdictions in the world and electricity costs, a key input in mining operations, are among the lowest in North America. Between 1955 and 1965, the Project operated as an underground mine, producing lithium carbonate products for sale to the North American market. 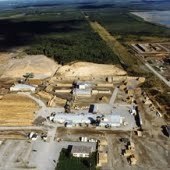 150-m-deep mine was operated under the former Quebec Lithium Corporation and included a surface concentration plant and refinery before all operations were suspended. Canada Lithium Corp., a "clean-tech" mine company is building an open-pit lithium carbonate mine and processing plant near Val d'Or, Quebec with intentions to meet the growing demand of the global market for electric and hybrid electric vehicles, as well as grid-storage solutions. It is anticipated that commissioning of the mine and plant operation, consisting of open pit mining to a depth of 150 metres below surface and utilising 150-tonne haul trucks and hydraulic excavators will occur in late 2012 and the full production of 20,000 tonnes of lithium carbonate per annum will be commenced in Q3 2013. Mining will be carried out at a rate of 2,950 tonnes per day. Mined ore from the pit will be crushed and stockpiled for treatment in the lithium carbonate processing plant. Metallurgical tests have produced battery-grade lithium carbonate from deposit samples and the Company plans to market its products in North America, Europe and Asia.